We’ve often heard auto drivers’ pet peeves of motorcyclists: weaving in and out of lanes, passing on the shoulder and speeding – all actions that often lead to a motorcycle accident. But would you believe motorcyclists are equally annoyed by some of these same actions by other riders? 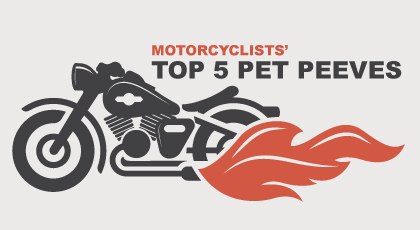 In a recent Harris Poll of nearly 200 U.S. motorcyclists, riders reported their top pet peeve about other riders is driving aggressively or recklessly, including speeding, weaving in and out of traffic, doing wheelies, etc.). While some motorcyclists aim to be meticulously safe on the road, others ride with reckless abandon. The poll asked riders to admit the “craziest, weirdest or most reckless thing” they’ve done while riding or seen others do. Those results included several riders who said they had stood on the seat with their hands in the air while speeding down the highway, and a couple riders reported seeing others texting while riding; again, all actions leading to a motorcycle accident. These results are alarming, as is the statistic that more than one in 10 riders reported they did not have motorcycle insurance. If you’ve been involved in a motorcycle accident, turn to us at KBG Injury Law for help. Request a free consultation for the Results You Deserve®.